Current President of Barnard College, former professor at Harvard Business School, member of the Board of Directors at Goldman Sachs, and mother of three, Debora Spar understands how difficult it can be for women to achieve professionally while balancing the concerns of family and the pursuit of ideal personal life. She is the author of six books, including Ruling the Waves: Cycles of Invention, Chaos, and Wealth from the Compass to the Internet, and numerous articles. In Wonder Women, Spar takes a “wise, worthy” (Kirkus Reviews) look at how American women’s lives have and have not changed over the last 50 years. “Tactfully navigating heated debates” while also narrating the story of her own successes and roadblocks over the years, Spar confronts the new issues that confront women and provides a roadmap for the future. Sponsored by Brandywine Realty Trust and Shechtman, Marks, Devor PC. Ticket price includes a copy of the featured book and a continental breakfast sponsored by the Four Seasons Hotel Philadelphia in the lobby of the library beginning at 7:30 a.m.
Louisa May Alcott is currently considered a "single author." If one or more works are by a distinct, homonymous authors, go ahead and split the author. 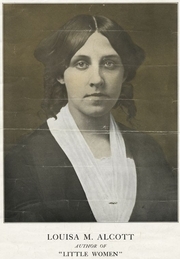 Louisa May Alcott is composed of 60 names. You can examine and separate out names.